and claims our kitchen wall. just crying out for daisy stickers. you had signed your name. tucked into the corner of another kitchen. just to see you shine. The Patron Saint of Lost Things. Do you have my brother? I have “lost” my brother. It is my duty to retrieve him. I wonder: does he lie broken beside misplaced car keys? You plucked Aunt Lina’s evening purse from the tracks. the steam and the sweat and the saxophone music. you let Aunt Lina keep everything she already had. among grains of rice and stray Cheerios. but it meant something to her. Anthony, I believe in you, the three miracles that made you a saint. gut of a Catholic cemetery. Just so you know: His name is Michael. at ShopRite – this week only! My gut goes con dios. I question the wisdom of candlelight. The earth is dust. This hollow ground contains my brother. He is too heavy to resurrect? Tammy Paolino is an award-winning journalist and poet living in Collingswood, NJ, a baseball's throw from Walt Whitman's grave. 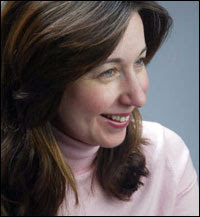 She is Features Editor of the Courier-Post in Cherry Hill and former Features Editor of the Home News Tribune. Her poems have appeared in Paterson Literary Review, Edison Literary Review and Mad Poets Review and have received several awards in the Allen Ginsberg Poetry Contest. She is author of "Eat My Words,'' a food and beer blog, and mom of two little poets-in-training. Queen of the Skee-Ball lanes, she frequently wields her poems in defense of the Garden State.